Forty years ago, when I attended Princeton Theological Seminary and lived on the second floor of Alexander Hall, I would have to walk down the hall and use the phone mounted on the wall, in an alcove, in order to call home. The experience was a lonely one for a young seminarian, looking out the window at the lush green lawn and trees while talking to my family 3000 miles away. Today, you don’t see phones usually mounted on the wall, nor do you see phone booths which were a mainstay 40 years ago. 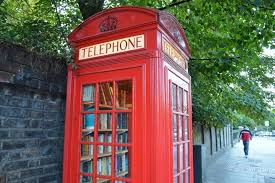 The only phone booth that I have seen in recent memory is a Red British style phone booth on Westheimer Road in the Galleria area of Houston, TX. Now we have cell and smart phones. You can now Skype someone for a meeting or have a Skype conversation with someone in Dubai. Communication resources have become far more sophisticated, advanced and have allowed for the greater dissemination and transmission of information in a more quick and instantaneous fashion. Why is it that we are so afraid to talk to each other ? Instead, you see people hovering over their digital screens in restaurants, planes, trains searching for that message or greeting that they can’t live without; something that will make their lives better. The insecurity of being unknown. Sometimes, this atmosphere can seep its way even into churches ! The British poet John Keats talked about negative capability. Our goal as healthy human beings could be to strive to dwell in a state of openness to all experiences, but in order to do that one needs to feel safe and one needs to feel connected. A lone- ranger approach won’t do. The more we can foster group experiences for people, including support groups in churches and other safe places, the more we can hope to engender better mental health and over-all functioning for all people. Yes, the technology has improved the speed and the volume of communication. The band width and the connectivity has increased, but our hearts have not necessarily felt open to share our very essence with others. May we be moved to step out of our life boats and wade through unknown waters, and realize again that we are part of a community that grows and heals together.